Just over two weeks ago, the City held the first of four public scoping sessions as part of a CEQR, or City Environmental Quality Review, for the proposed four new jails. 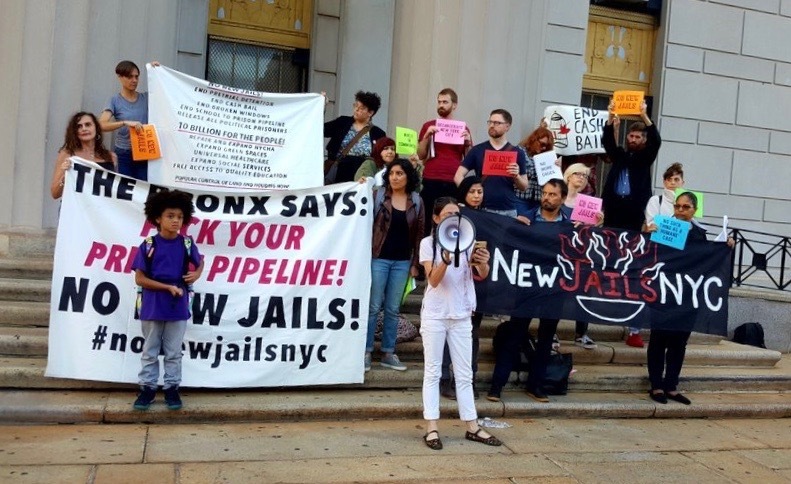 Together with the No New Jails NYC Coalition, Critical Resistance NYC mobilized for the four hearings, with a press conference and strong presence at the final scoping session in the Bronx Wednesday evening. The coalition’s demands were loud and clear: shut down Rikers now, and do it without building any new jails. Coalition members and activists from the Bronx spoke out at the press conference, in particular letting Borough President Rubén Díaz, Jr. know that his support for a new jail in the Bronx was an unacceptable, shameful, and dangerously divisive position that pits neighbors against one another, leaving behind those at the frontlines of policing and imprisonment. 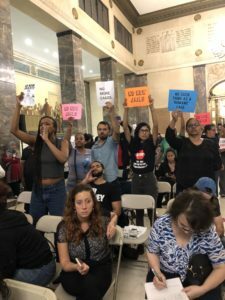 Dozens of powerful testimonies were presented Wednesday night, collectively condemning the brutal displacement that is bound to occur if these jails are built, and the Mayor’s disinterest in the livelihood of the people of New York. CRNYC member Pilar Maschi delivered passionate testimony lasting 18 minutes as No New Jails NYC supported her, chanting “Let her speak!” and pushing the City to back down as they tried to physically remove the microphone from her hands. However, some of our neighbors delivered racist testimony that prioritized white supremacy and the preservation of property and wealth, conflating policing and imprisonment with safety. There is a deep societal assumption that there are people who should be not be living with dignity. This is destroying us, and we cannot allow these systems to continue. 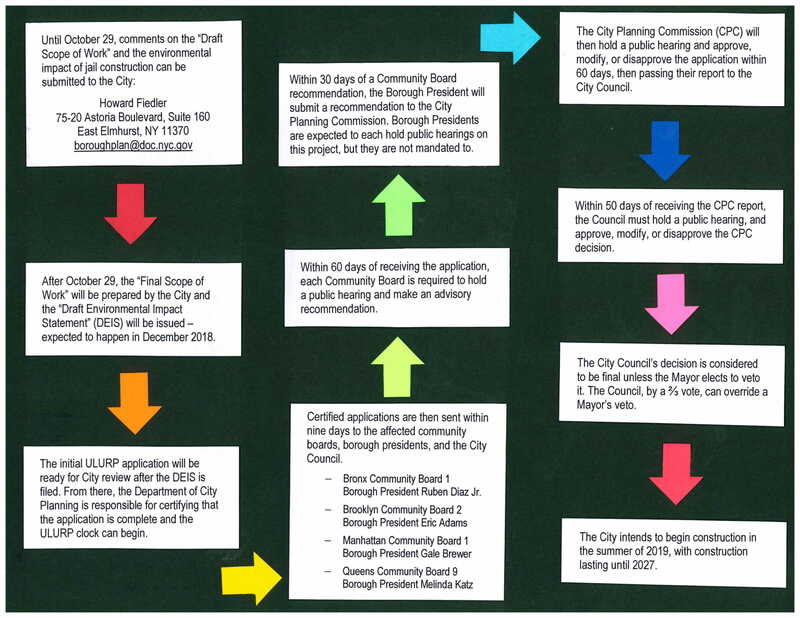 As all of these hearings have been happening, the Mayor has been busy obstructing efforts to bail people out of jail; regurgitating tough-on-crime talking points in reference to young people imprisoned in the Bronx; reclining behind a “sanctuary city” label while ICE frequent city courthouses; and praising the expanding reach of invasive policing tactics in schools – all while the recently “closed” and yet to be bulldozed Rikers jail, GMDC, keeps the air conditioning running for the C.O.s staffed inside. The “abolition now” demand is the only real response to the massive scale of city-sponsored oppression in New York. Jails are the core of a racist criminal legal system that disposes of people already marginalized by displacement, unemployment, and criminalization. We cannot have safe and whole communities when people are being forcibly taken out of them. We have to demand what should be; we have to envision what this City without jails must look like and we must build that place together. These public scoping sessions were deliberately designed to discourage mass dissent, as will the hearings to come. In spite of the prohibitive boundaries that the city built up to stop us all – boundaries like metal detectors and police – these scoping sessions became a space to organize and speak to and with people about the possibility of a city without jails and the alternatives we have to the Mayor’s nonsensical plan. Through sharing ideas, through building relationships, we became much stronger. People, residents adjacent to jails, community groups, organizers, artists came together under a unified voice: jails dehumanize people and new jails should not be built. Not in Brooklyn, not in Queens, not in Chinatown, and not in the Bronx. More than ever, we are ready to fight jail construction in New York City and we are ready to win. 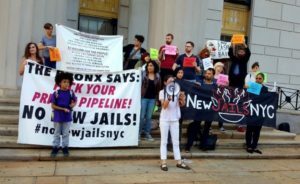 Join No New Jails NYC!